For any business or service, an extremely important thing is clients showing up on time. The reason for this is simple: every missed appointment adds to the time and money wasted by the business. A good way to prevent this is appointment cards. 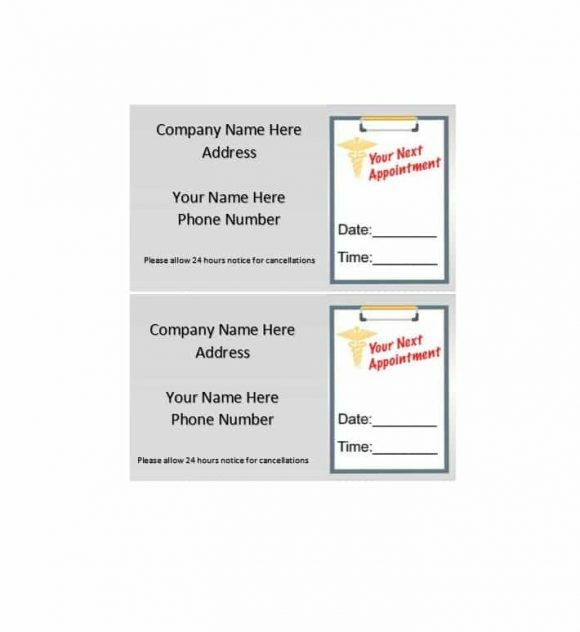 In order to ensure this, refer to appointment cards templates. An appointment card will ensure that your clients have the appointment in the back of their mind at all times before the meeting with you. 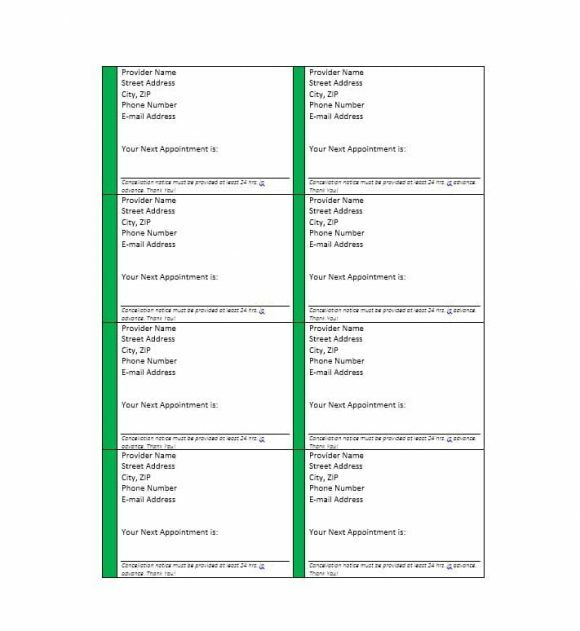 Appointment cards will force your clients to check the calendar for the appointment every now and then. 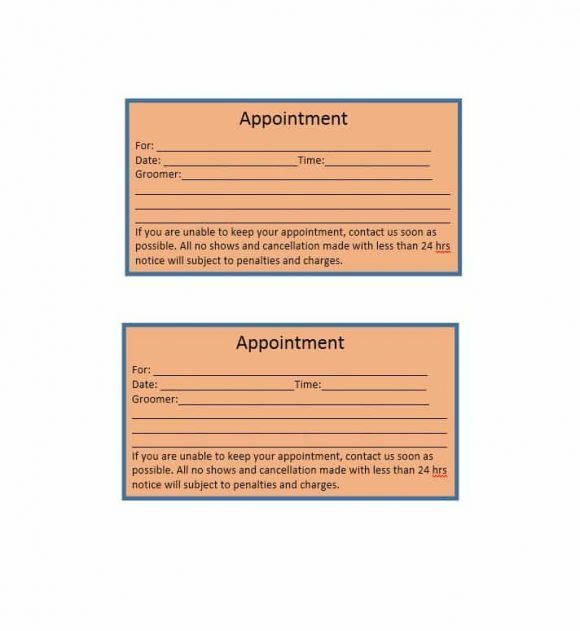 A less quoted benefit of appointment cards is clients calling you up to reschedule their appointment in case they aren’t able to make their appointment. Just like writing something down increases your chances of remembering it, a physical reminder such as an appointment card forces you to remember an appointment. 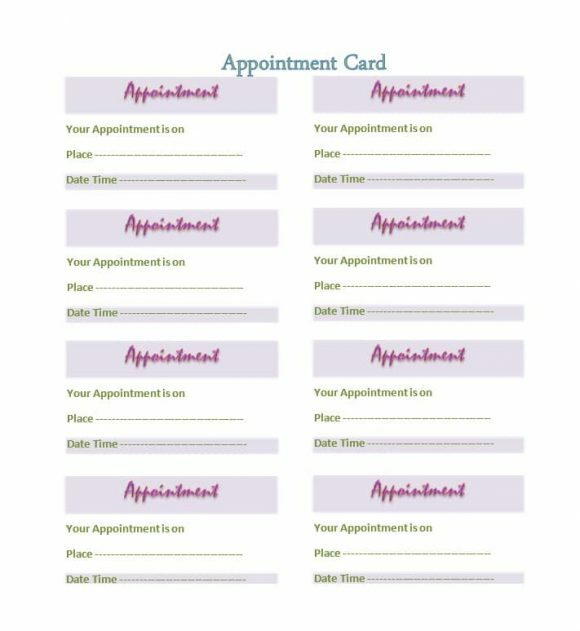 Today, you will find many different types of appointment cards. However, the majority of these cards contain the same things. 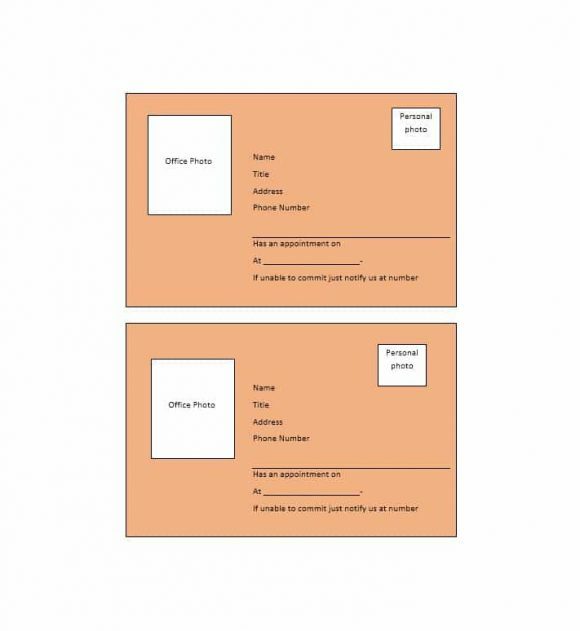 To know what things are included in appointment cards, take a look at appointment cards templates. An age-old problem is clients failing to make their appointments. Fortunately, today we have appointment cards to deal with and solve this problem. The appointment cards remind the clients about the importance of making their appointment. Also, it provides them the number of the service provider in case they want to make any changes to their appointment. 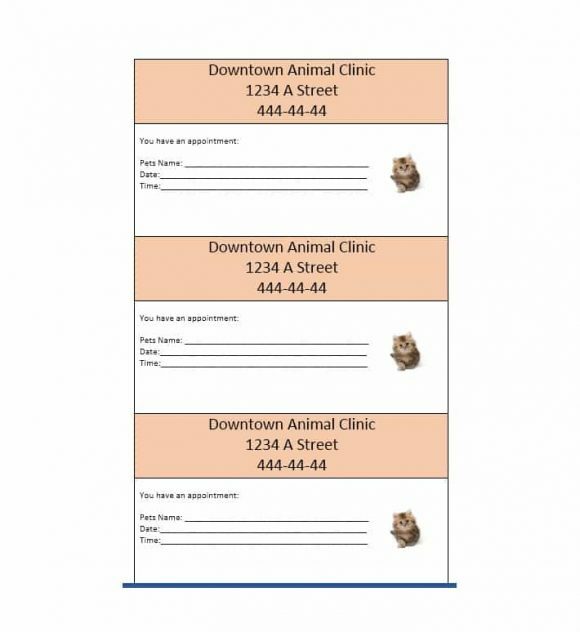 Moreover, appointment cards help to keep the business or practice in the mind of the client. In simple terms, appointment cards are an unconventional way of marketing your business or practice. To do this, all you need to do is add the website address of your business/practice to the appointment card. 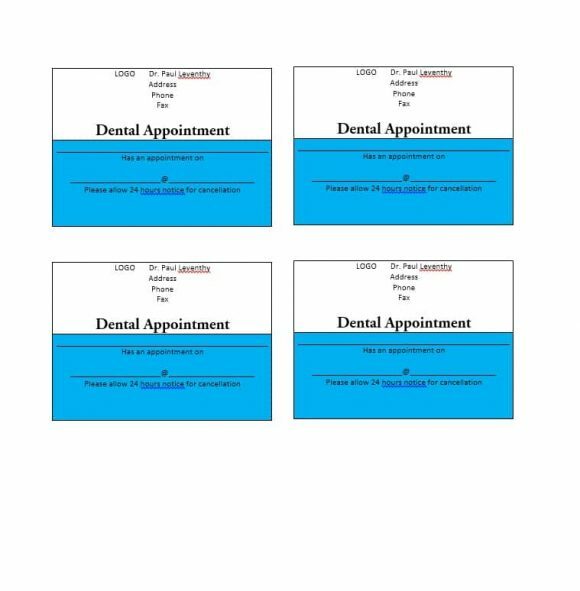 In short, in addition to reminding clients about their appointments, appointment cards help to market your business/ practice. Having an appointment card for your business/practice is a no-brainer. 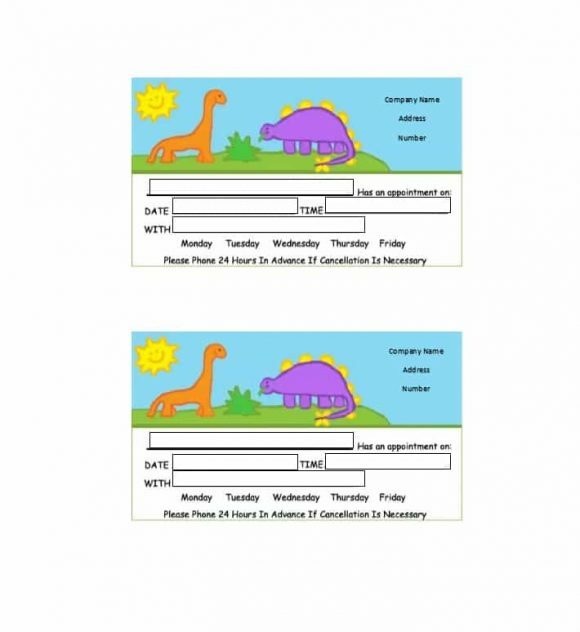 Take a look at appointment cards templates to find out what you should include in your appointment card. 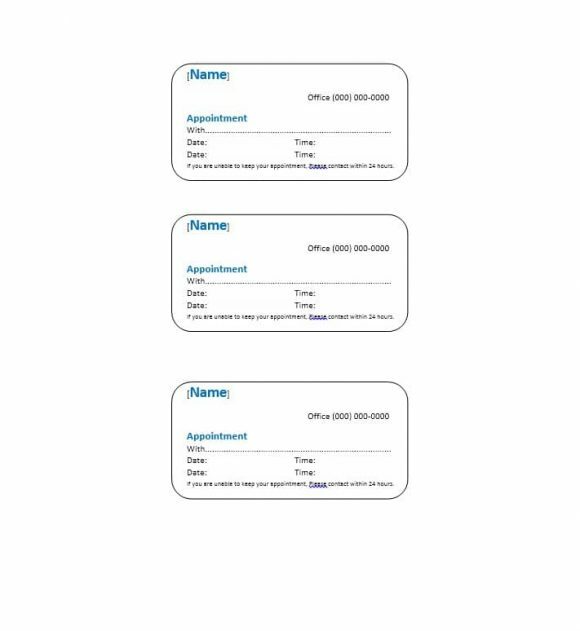 Let’s now take a look at a few different types of appointment reminder cards. Special types of businesses, medical practices need special type of marketing. The work of medical practices is highly specialized and their importance in any community is significant. For this reason, medical practices must do all they can to maintain their reputation. Clients not showing up for their appointments can hurt the reputation of a medical practice. Fortunately, there is a way to prevent this. The way I’m referring to is the creation of appointment cards. Also, appointment cards are a good way for doctor to advertise their practice. The use of traditional advertising/marketing methods is not a viable way for doctors and other medical practitioners to market their business. If you invest too much in advertising your business, your clients may see you as tacky. While it’s perfectly alright to look for ways to attract new patients, you should avoid any such actions that exhibit to patients that you’re not serious about your work. 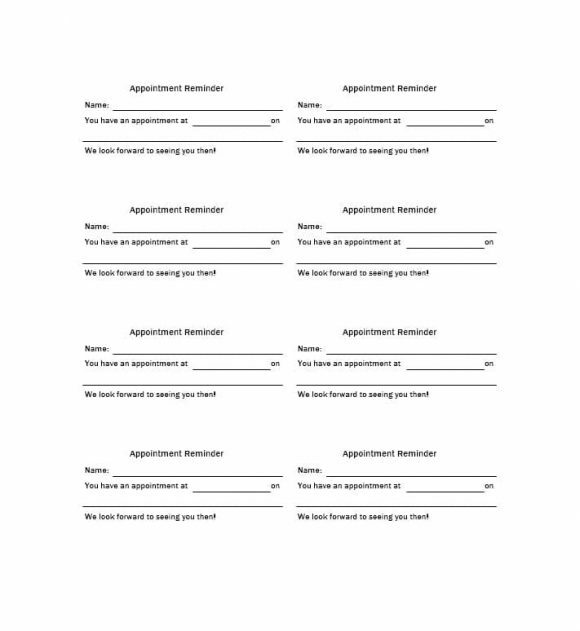 To create an appointment card that markets your practice and ensures that clients make their appointment, refer to appointment cards templates. Talking about templates, you can find many templates online including templates of medical forms such as a medication list templates. 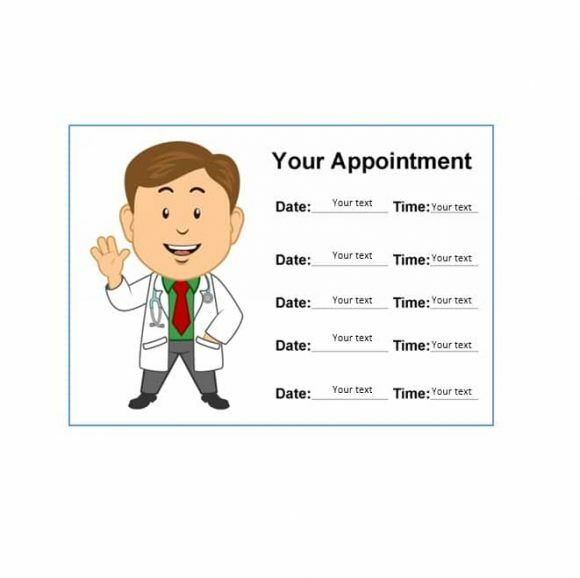 Coming back to the topic at hand, let’s take a look at how medical appointment cards can help your practice. Medical appointment cards do much more than just remind clients about their appointments. There are several other benefits of these cards including developing returning patients. 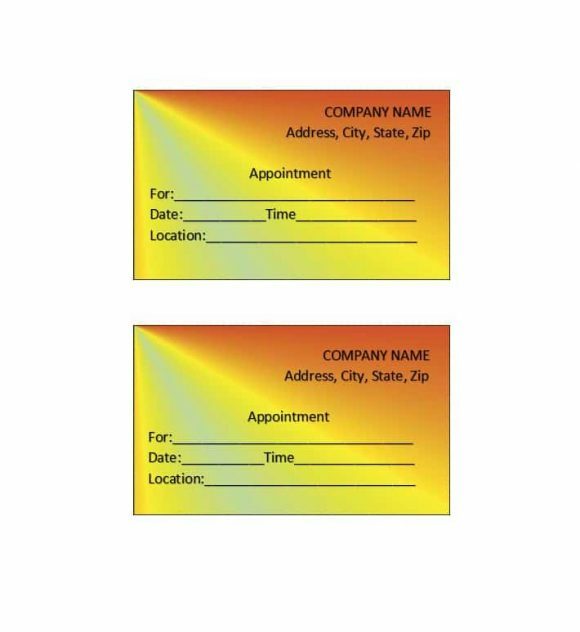 Compared to any other business card, your patients are more likely to hold onto the appointment cards you provide them simply because it contains important appointment information. What makes things even better is the fact that like business cards, the medical appointment cards contain important contact information for the patient to see and remember. The utility of the medical appointment cards will help them avoid the trash bin. 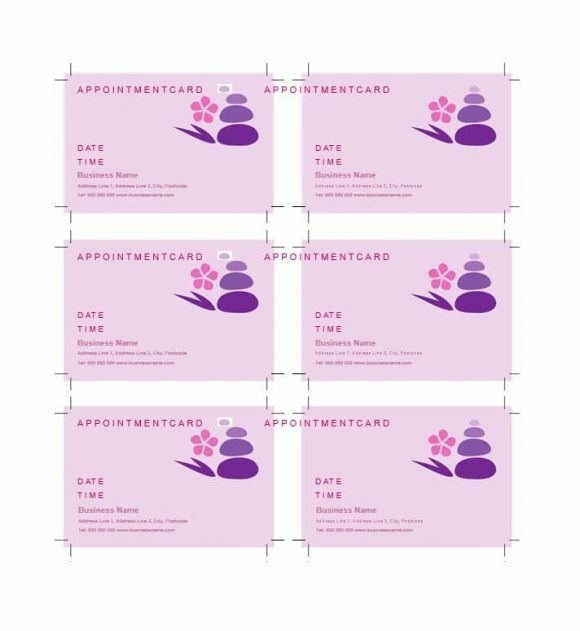 However, if you want your appointment cards to catch the attention of your patients, you must create an attractive card design. 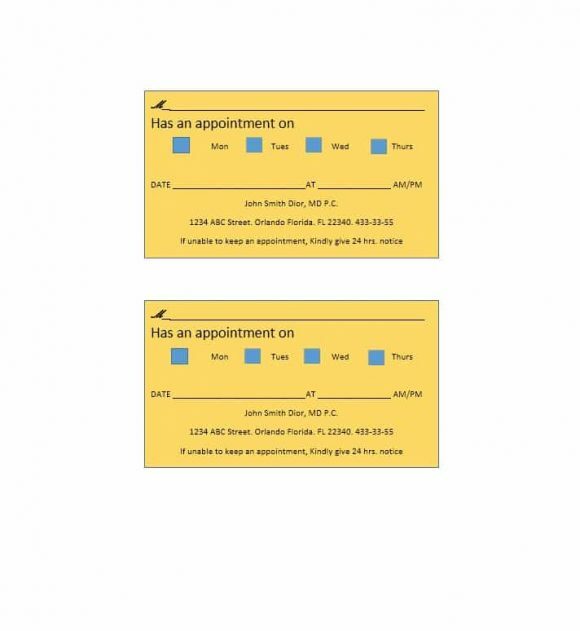 To find out how you can do that, take a look at appointment cards templates. 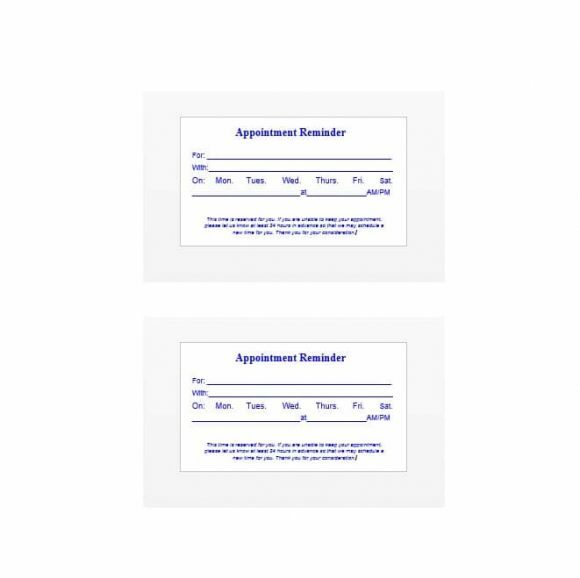 In short, think of appointment cards as a great opportunity to market your practice to patients. 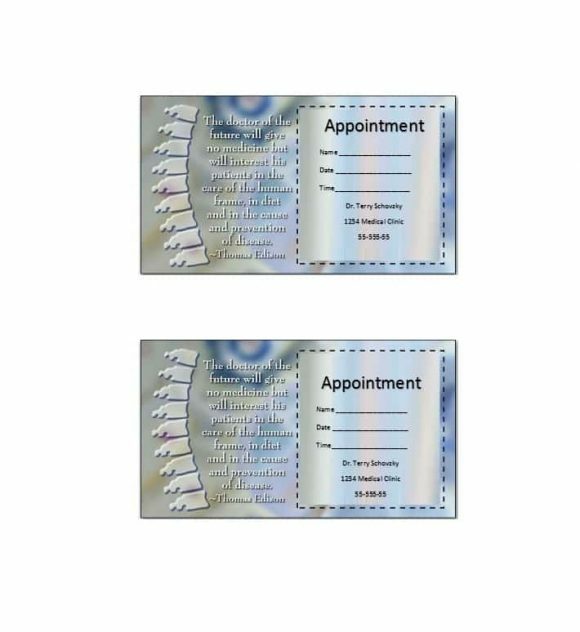 By investing in an attractive appointment card design, you will be able to catch the attention of your patients and exhibit that you’re serious about your work. This in turn will help you develop returning patients. Ultimately, this will help you to get new patients. 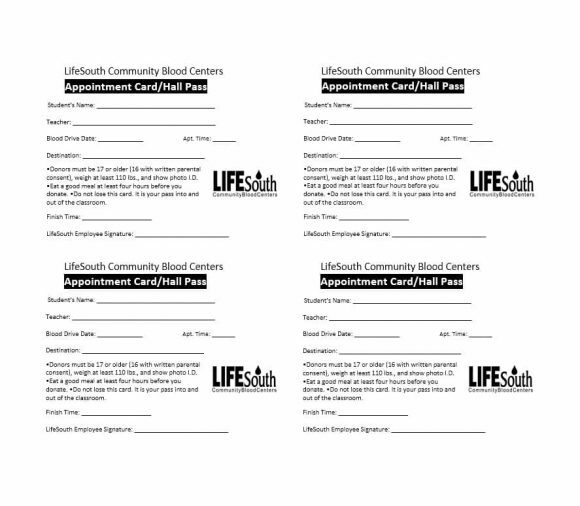 By combing the lasting impact of print with the bona fide appeal of word-of-mouth advertising, medical appointment cards help doctors and other medical practitioners to develop returning patients as well as attract new patients. 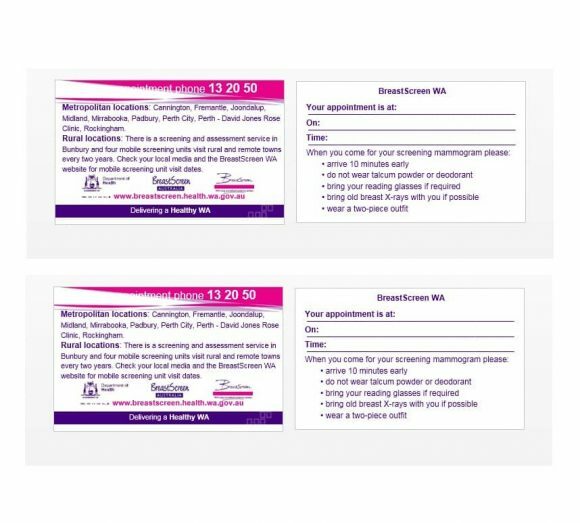 In short, appointment reminder cards are a great way for you to advertise your practice without ‘actually’ investing in advertisement. 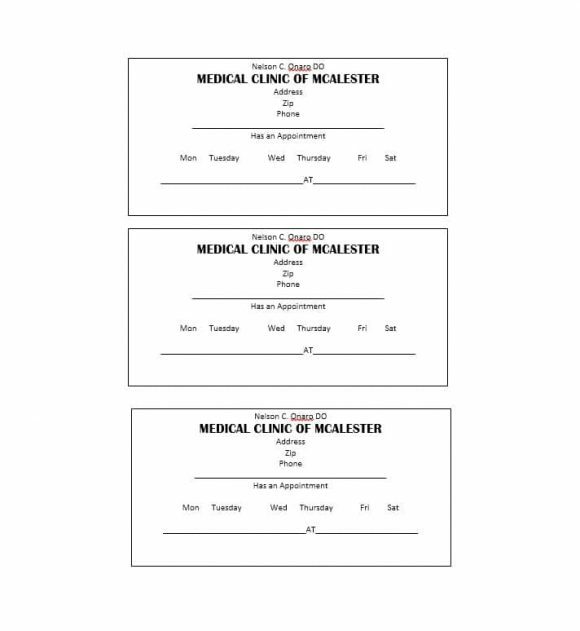 As seen above, medical appointment cards are a great way for doctors and other medical practitioners to market their practice. 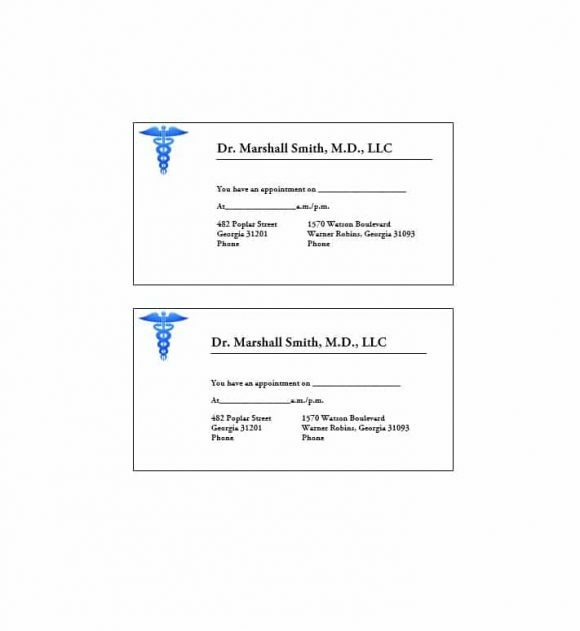 To create an eye-catching appointment card, refer to medical appointment cards templates. In addition other templates related to the medical practice that you can find online include the emergency contact form template . 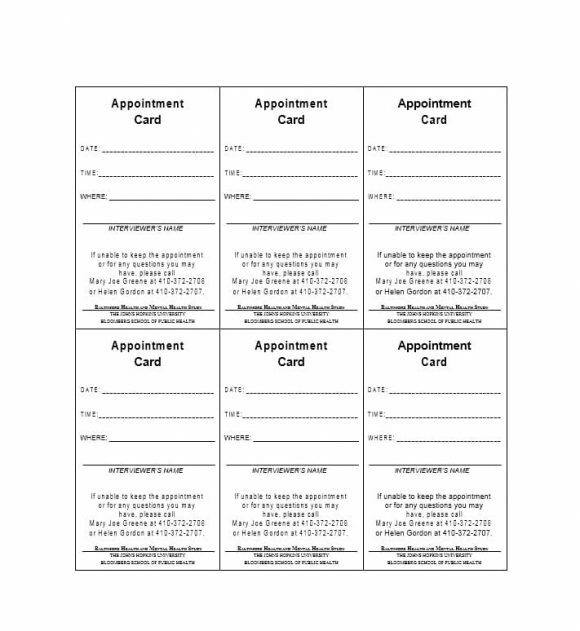 Continuing care appointment cards are mainly used by dentists. 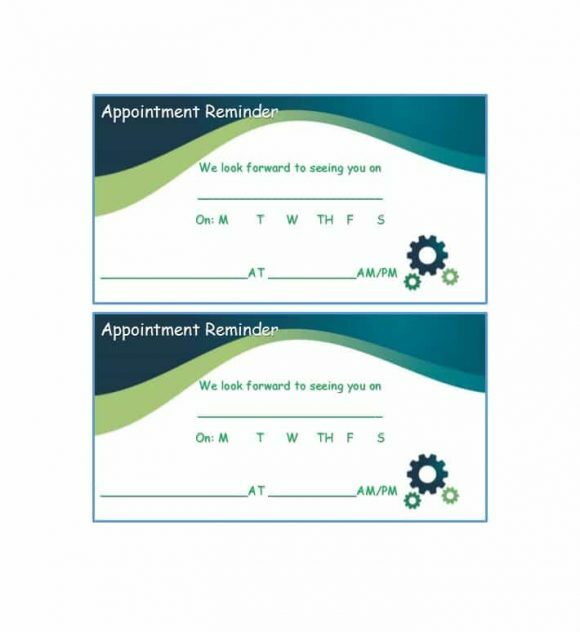 As the name suggests, continuing care appointment cards are used to remind patients about their continuing dental care appointments. Maintaining dental hygiene is extremely important. This is something continuing dental care helps to ensure. Why is continuing dental care important? First of all, continuing dental care ensures regular cleanings. This in turn allows patients to maintain a healthy mouth. Also, most dentists diagnose patients for any potential problems during these visits. 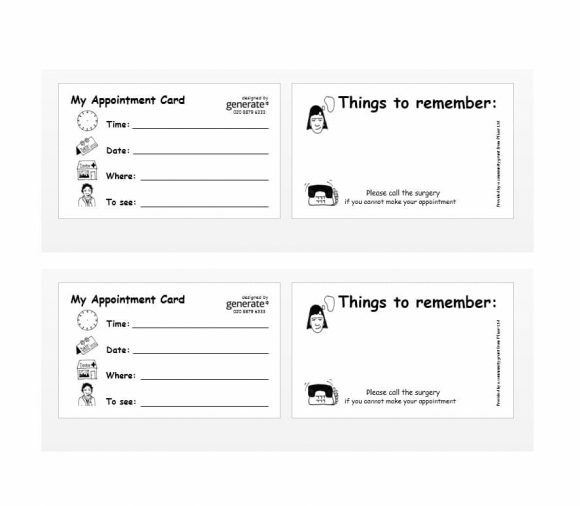 A good way for you dentists to ensure that patients show up for their continuing care appointments is using appointment reminder cards. 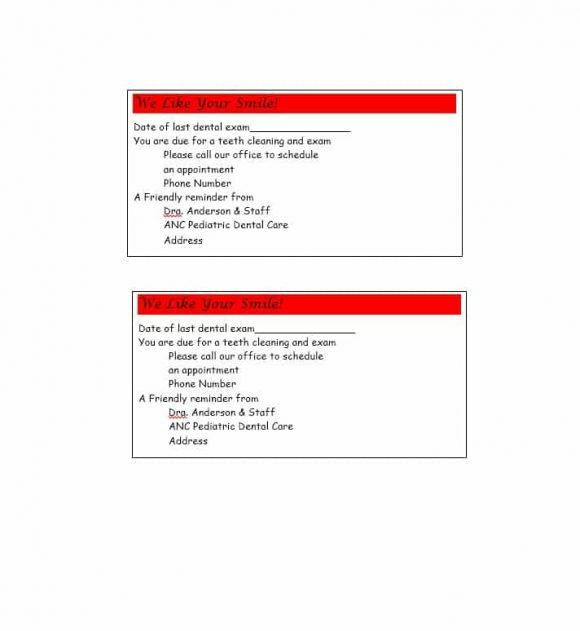 In addition to ensuring that patients show up for their appointment, continuing care appointment cards help the dentists to market their practice. 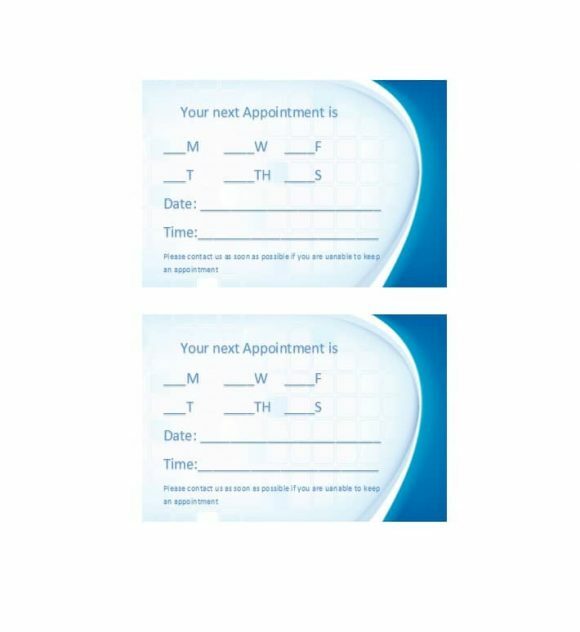 In short, continuing care appointment cards ensure a win-win situation: patients maintain their dental hygiene while the dentists are able to market their practice. 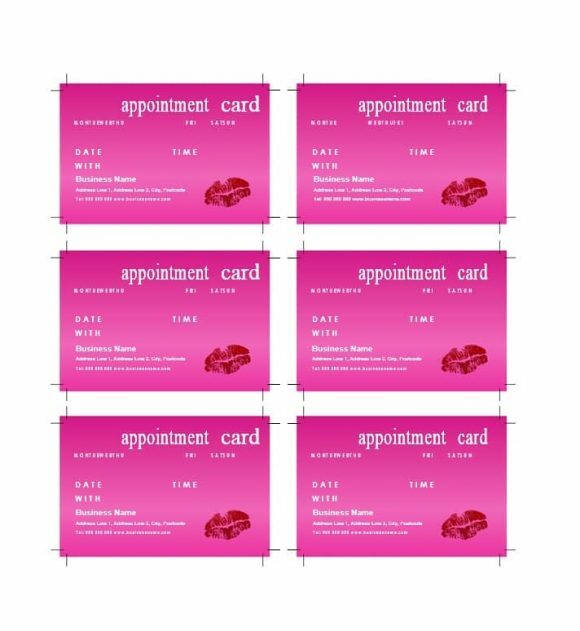 Today, there are many different kinds of appointment cards. Luckily, templates of each kind of appointment cards are easily available. 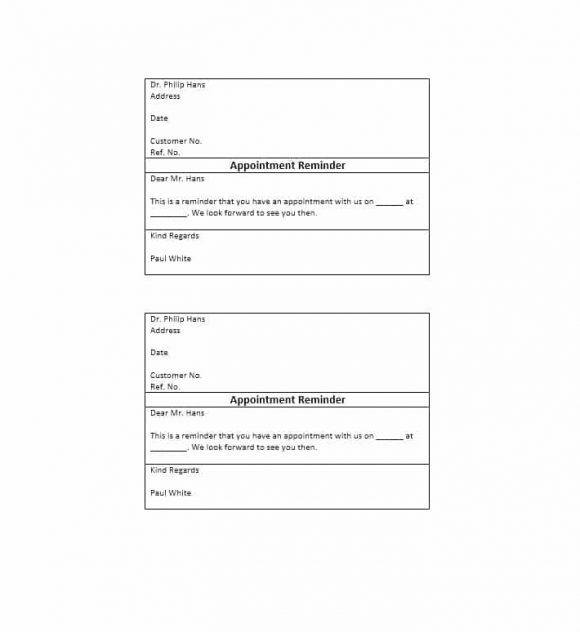 Following are some appointment cards templates that you can use. 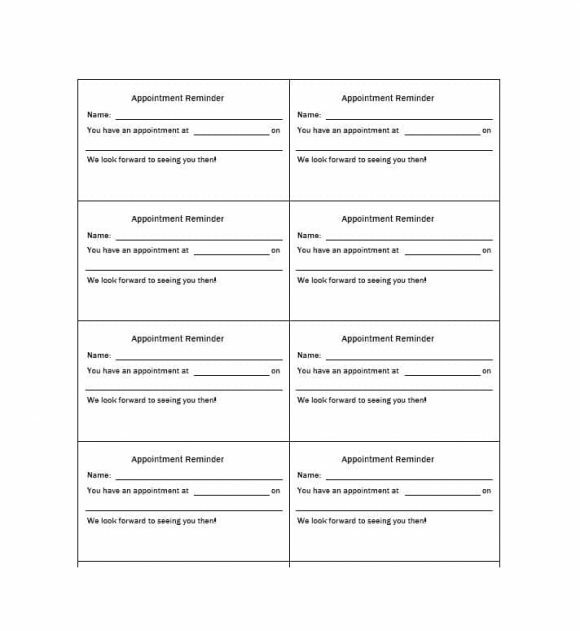 The first type of appointment card template available to you is a printable appointment card template. Used by doctors, this type of appointment card contains an embedded medical sign. 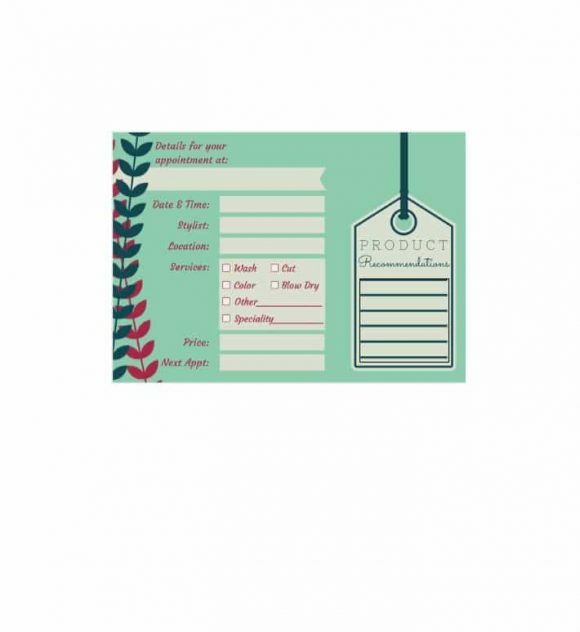 This type of appointment card template contains blank spaces in which you can write down the date, time, and agenda of the meeting. As the name suggest, green appointment business card is an appointment card green in color. 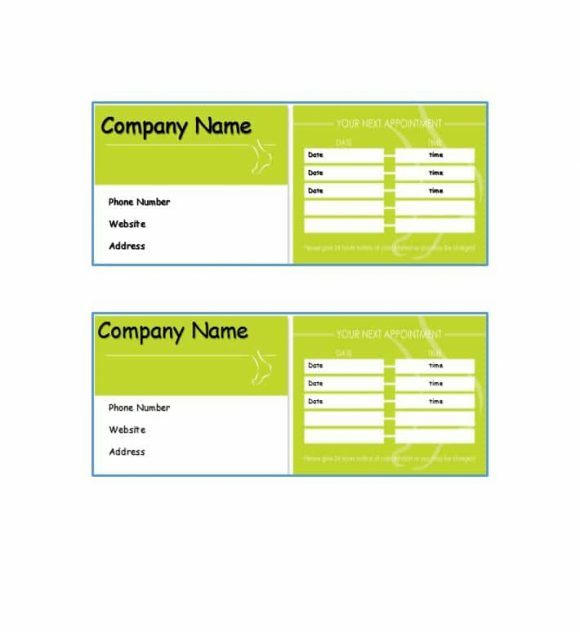 A simple appointment card template, the green appointment business card template is easily editable. However, it is important to keep in mind that you can only edit the front side of the card. 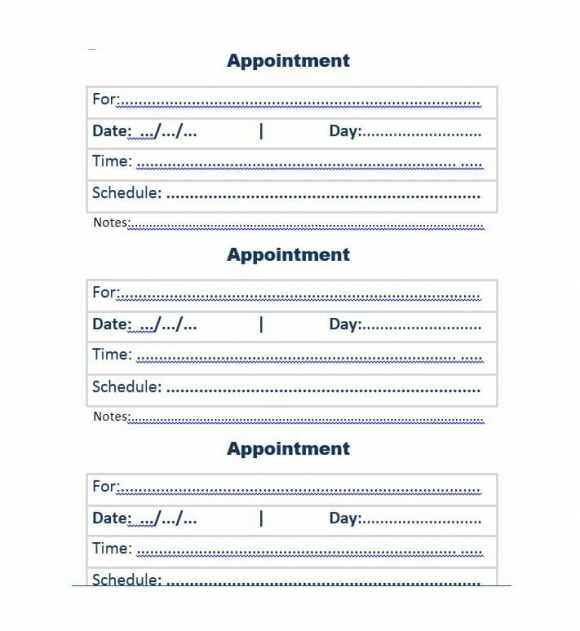 Two blank spaces are provided in the card for you to fill in the date and time of the appointment. 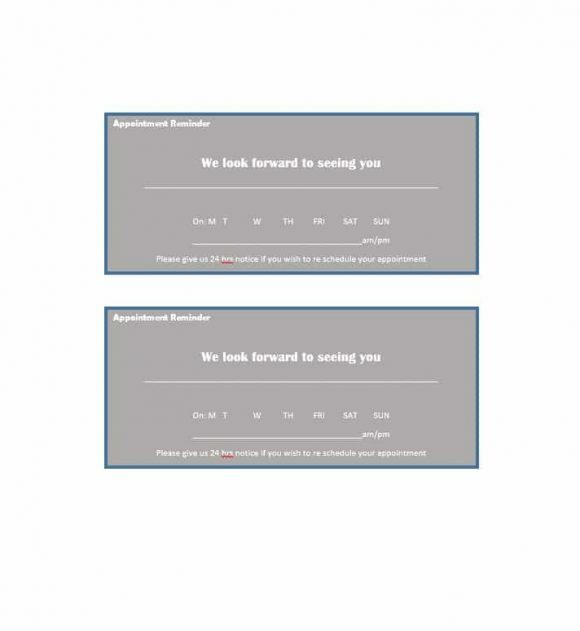 You cannot resize this type of appointment card. The template comes with ten cards per page. 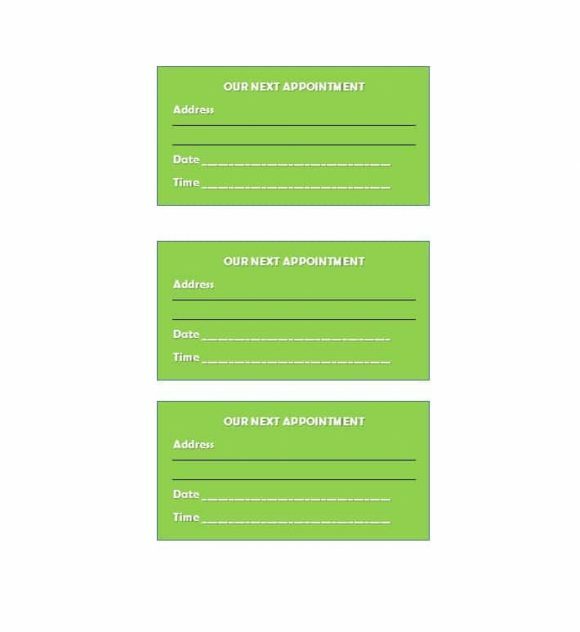 People looking for basic appointment card will love the green appointment business card template. However, this template is not for you if you’re looking for something a bit more detailed. You can edit these spaces according to your preferences for a particular situation/client. You have the luxury of expanding or minimizing the size of the card according to your preference. Moreover, this template has a section in which you can include any additional information related to the appointment. 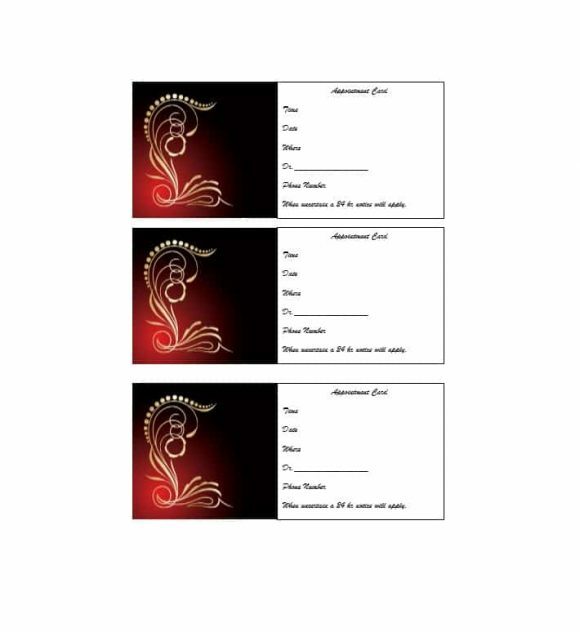 You can find free blank editable appointment card templates online. 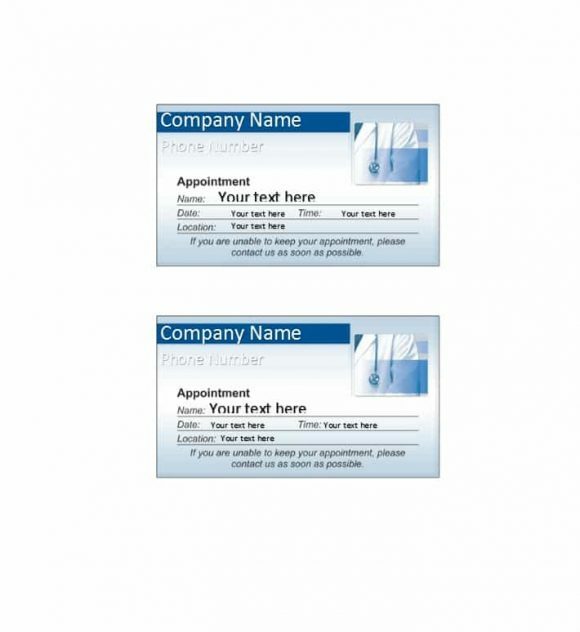 As the name suggests, the surgery appointment card is an appointment card used by surgeons. This card is particularly useful for surgeons who deal with kids. Most people find surgery appointment cards unique and eye catching. This is mainly due to the graphics on the card. 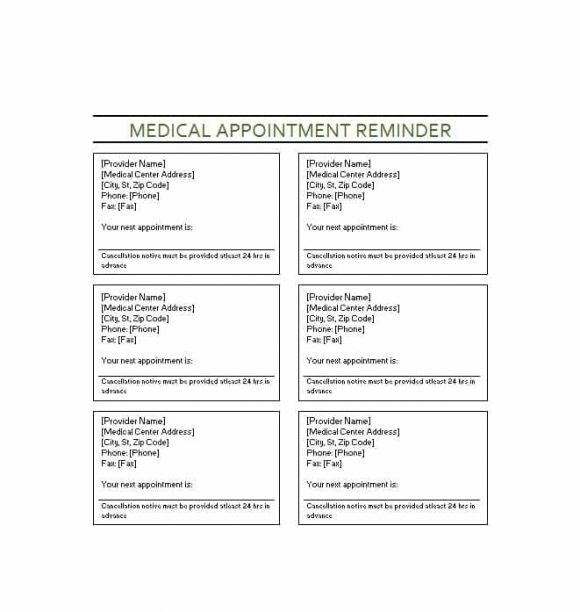 In addition to ensuring that patients show up for appointment, surgery appointment cards remind surgeons to follow up on appointments. Moreover, a surgery appointment card helps surgeons to market their practice and boost their image. 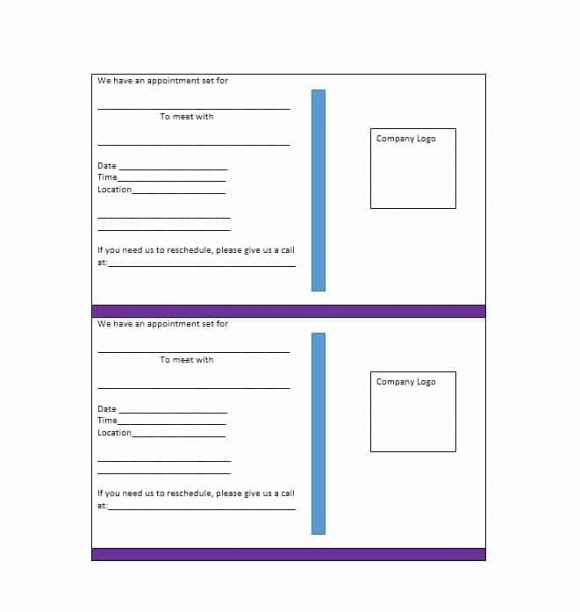 You can create a unique and eye catching surgery appointment card by using a surgery appointment card template. 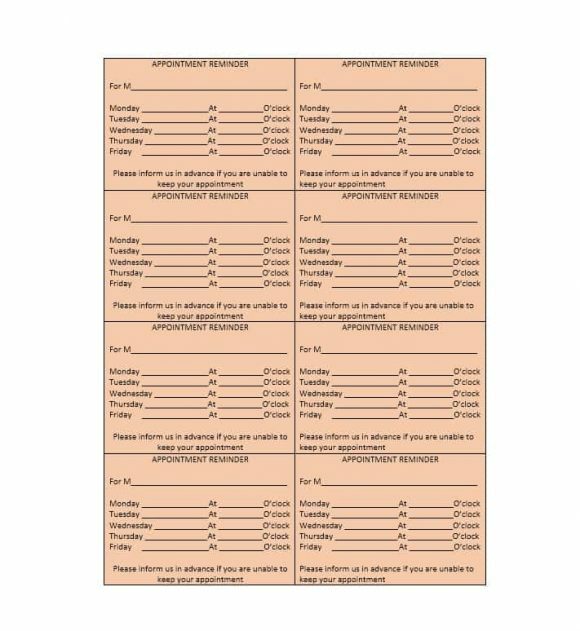 While the main purpose of a surgery appointment card is reminding patients about their appointments, it can be used to keep track of appointments and promote your practice. 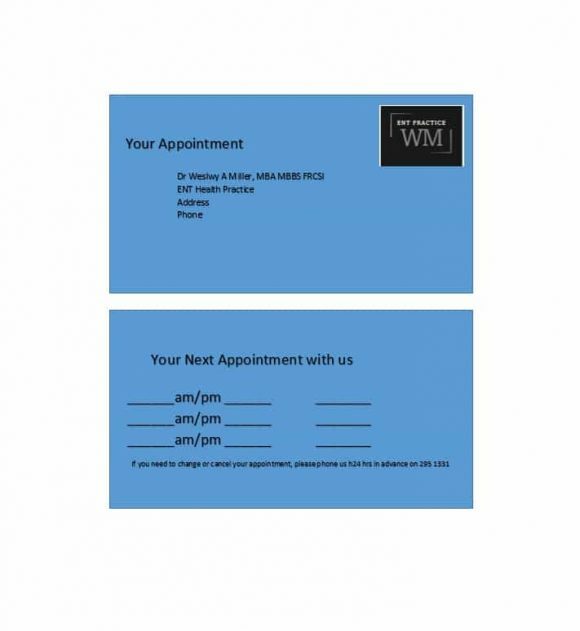 The final type of appointment card template on our list is the custom appointment card template. Creating a custom appointment card is easy. Basically, by using a custom appointment card template, you can design a unique and attractive appointment card. This card will set you apart from the crowd. 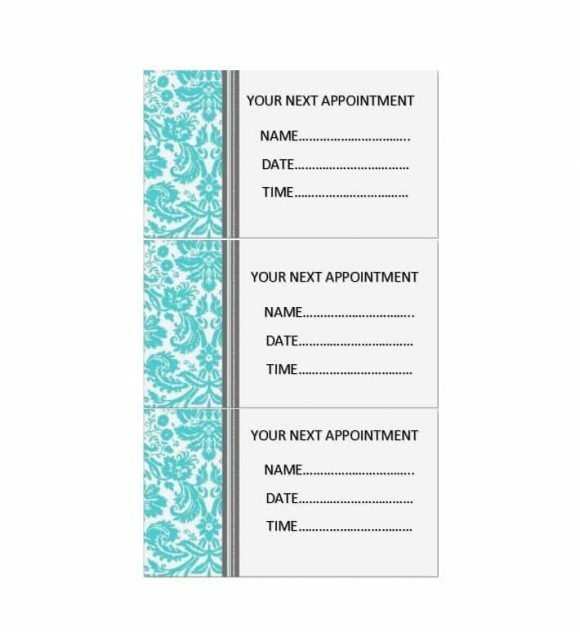 Using a custom appointment card template is an easy and inexpensive way to create an appointment card that reflects your and your client’s unique needs. 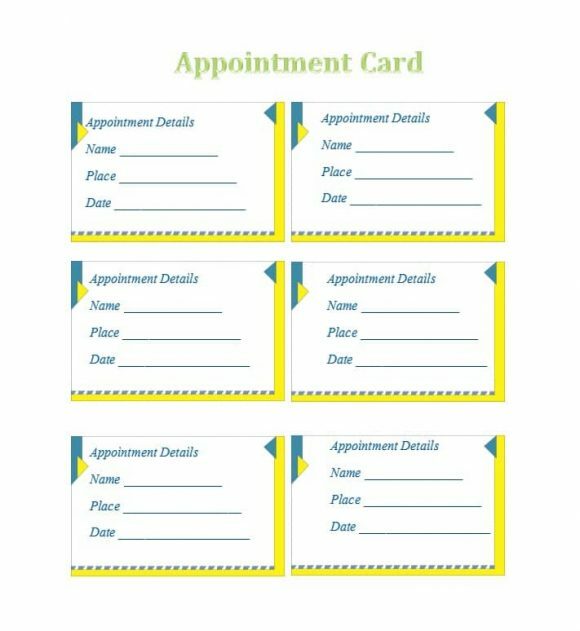 Appointment cards are a great way to ensure that you clients/ patient make their appointments. 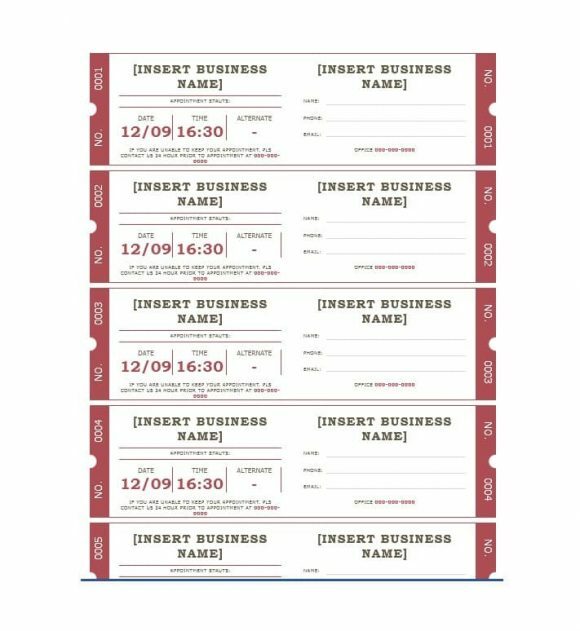 Additionally, appointment cards help you to keep track of appointments, market your business/practice, and boost your image. An easy way for you to create unique and eye catching appointment reminder cards is using appointment cards templates. 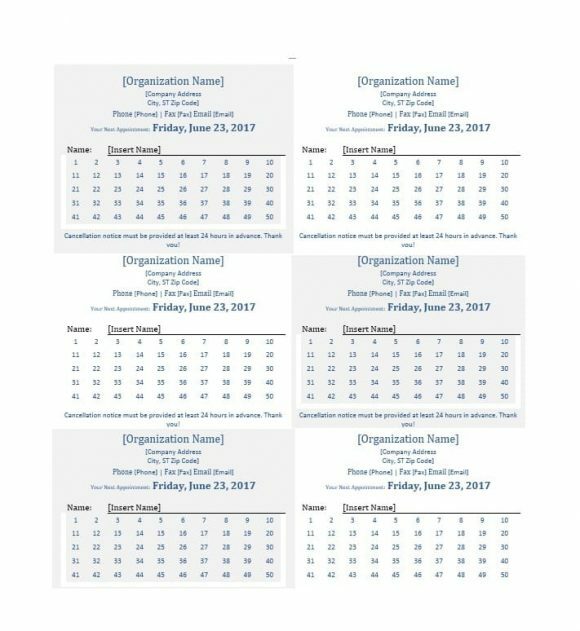 Easily available online, these templates can be edited/customized to create the appointment cards that suit your preferences. Today, most people have busy schedules. In such times, a good way to keep clients coming back is using appointment cards. 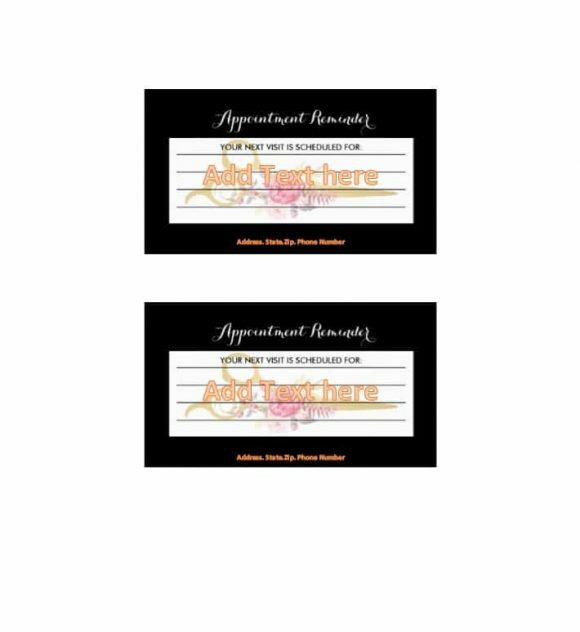 Appointment cards with the message and logo of your business or practice will remind clients/patients about you which in turn will keep them coming back to you.